If you are looking for a relaxing break from the city life, then a trip to the beautiful landscapes of Kefalonia island is what you need. Kefalonia (or Cephalonia) is the largest of the Ionian islands, located next to Zakynthos and Lefkada. The island of Kefalonia is a popular holiday destination for families, as well as everyone who enjoys exploring nature, beautiful seas and coves. The renowned beach of Myrtos, often voted amongst the best beaches in Greece, has made Kefalonia famous across the globe, for its turquoise waters and white sand. Myrtos though is only a small taste of the elements, colours, and beauties that make Kefalonia a unique travel destination. Search ferryhopper for all the available ferry schedules to Kefalonia and book your ferry tickets as soon as possible! Kefalonia is connected with frequent itineraries with the mainland Greece and the other Ionian islands during the whole year. 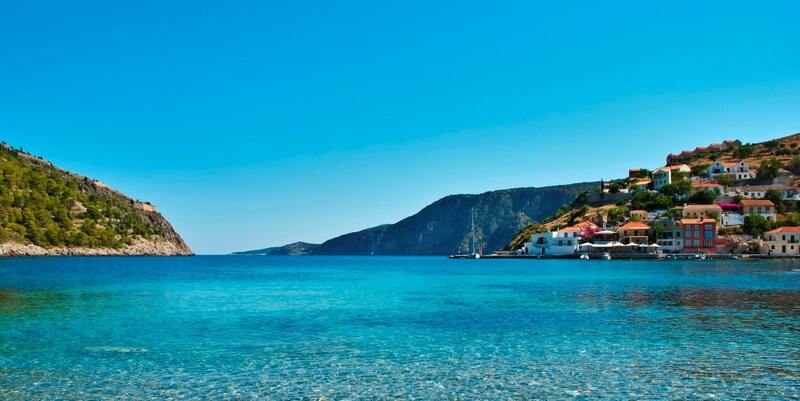 If you are interested in island hopping at the Ionian sea, Kefalonia is a great option since it offers connections with other nearby islands like Ithaki or Zakynthos. The island of Kefalonia is well-connected to the mainland Greece with both the ports of Kyllini and Patras in the west Peloponnese. You can travel from Athens to Kyllini and Patras by bus and then take the ferry to Kefalonia. The bus routes from Athens to the west Peloponnese are frequent and it takes 2,5 hours to reach the port of Patras and 3,5 hours to the port of Kyllini. Kefalonia is easily accessible from mainland Greece as it is frequently connected with ferry itineraries from the ports of Kyllini and Patras. The ferry trip from Kyllini to Kefalonia (port of Poros) lasts approximately 1,5 hours while the Patras to Kefalonia (port of Sami) route can take approximately 3,5 hours. During the winter, Kefalonia has regular itineraries every day that connect the island with both the ports of Kyllini and Patras. During the summer months, the ferry route to Kefalonia is primarily served by the port of Kyllini with at least 4 ferries operating every day. The ferry ticket prices start from 10€ for a standard economy ticket. We recommend that you search ferryhopper for all the available ferry itineraries to Kefalonia as the frequency of the ferry connections as well as the departure ports are subject to change every year. Before you book your ferry tickets to Kefalonia it is good to keep in mind that the island has two main ports: Sami and Poros. The two main ports of Kefalonia are both located in the east side of the island but serve different ferry routes. Port of Sami: The port of Sami primarily serves ferry routes to Patras, Ithaki and Italy. Port of Poros: The port of Poros primarily serves the ferry route to Kyllini. Located in the middle of the Ionian sea, Kefalonia has frequent connections to nearby islands which allows for a great island-hopping experience. From Kefalonia you can take ferries to Ithaki, Zakynthos, Corfu as well as the port of Brindisi and Bari in Italy. The island of Kefalonia is a real charmer, both cosmopolitan and with wild natural beauty. Kefalonia combines diverse landscapes, beautiful beaches as well as a variety of activities and cultural events on offer throughout the year which make it a great holiday destination, ready to please all different tastes. Kefalonia tip: If you travel without your own vehicle to Kefalonia it is useful to know that the island has a good bus service network. It is also usual for people to use local taxis for their transport to the island but since the distances are long it is good to check in advance the rates for every destination. Are you planning to visit Kefalonia for your holidays this year? Check our ferry search engine on ferryhopper, find all the available ferry itineraries to Kefalonia, and book your ferry tickets fast and in the best price!